Not much new to report this week, but more of the same. Gertrude is enjoying her literacy class. She is really in her element. She does get somewhat frustrated as she is teaching her students how to do some basic things on the computer. They tell her they understand what to do, and then they go and do something completely different. On day she left the class as they were typing their stories when she came back one person who was typing most of the day lost all their work and came up with something on the screen that Gertrude has no idea how they did it. I thought it would be good to share some pictures of some of our co-workers. This couple is Bob & Carolyn Lee. They arrived in New Ireland 10 years before Gertrude arrived in 1976. 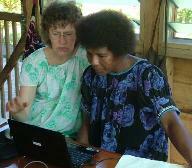 They completed the New Testament for the Madak people group here. As they have been a part of NITI they are helping two languages groups that are close to Madak. One is the Notsi-Madak which is a transition language between Notsi the group Gertrude and I are working in and their language group. They are also working with the Nalik people group. Besides that they are continuing their work with the Madak on Old Testament portions which they plan to publish next year. Ed Condra I guess he could be called the founder and director of NITI, but he does not even think about a title for himself. He came to Sohun back in 1983 finished the New Testament for the Papatar people group here. It was back in 2003 that the Lord opened doors for him to start NITI to train Papua New Guineans to do the remaining translations in New Ireland. Today he is helping to oversea two Papatar dialects that are being translated as well as Barok. He is also leading a team that is doing Old Testament translation for the Papatar. Both he and the Lees only come for the NITI course for a month or more and then return to the U.S.A. There is much they try to complete in the short time that they are here.